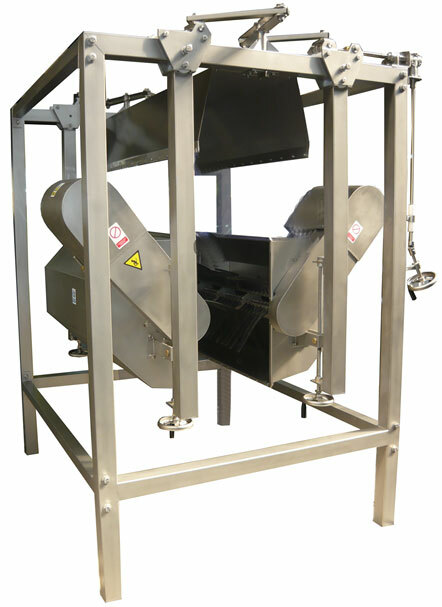 The MSK-1 combined washer and picker, also known as flail washer, is designed for the removal loose feathers after the final defeathering machine. The combined washer and picker is constructed entirely of stainless, acid-resistant materials. Two casings are mounted symmetrically to a robust framework, with shafts fitted with special rubber fingers (the so-called whips), 265 mm long each. Poultry carcasses are transported in shackles of the overhead conveyor between axial guides, which double as spraying collectors. The counter-rotating shafts with rubber fingers and the water spray shower from the collectors ensure thorough washing and clean the feathers left over from basic picking operations as well as other impurities. Design of the combined washer and picker allows for adjusting the spacing and height of picking shafts and water shower to match the bird size. Compact design and the use of high-quality materials ensures durability and facilitates cleaning the machine to maintain sanitary requirements.